TWIN BRIDGES – Twin Bridges town council unanimously approved a resolution to create a storm water Special Improvement District in the town and proceed with $600,000 plans for collecting and moving storm water from city streets at their January 8 meeting. 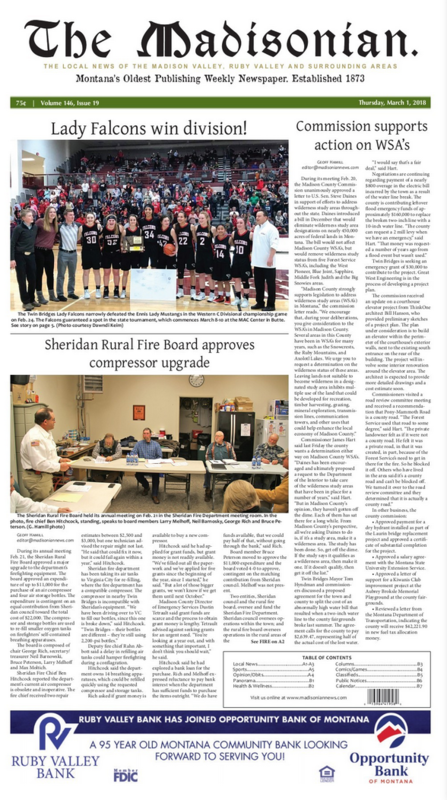 SHERIDAN—The Sheridan school board continued deliberations on a potential football co-op with Twin Bridges Schools at its monthly meeting on Tuesday, January 8, ending with a vote that approved moving forward on the proposal in a split on the board of 4-3. Virginia City hosted its annual Winter Fest on Saturday, January 5. The day included broomball played on the town ice rink, sledding, marshmallow toasting, a log sawing competition and a fire hose roll, plus a lunch provided by the Virginia City Elks Club. Doug Martin from the United Veterans of Twin Bridges Area awarded 2nd grader Lilly Mae Banks a letter of appreciation and a gift certificate this week for her service to the community and help to the United veterans group. Lilly volunteered her help last Sunday at the annual Veterans community dinner in Twin Bridges from 10:30 a.m.